A "truly original" collection of 26 Holmes stories officially authorized by Dame Jean Conan Doyle. This is the paperback first. A hardcover was released in 1997.
in this intriguing anthology of 26 new stories about the most famous and popular detective in the annals of literature–Sherlock Holmes. 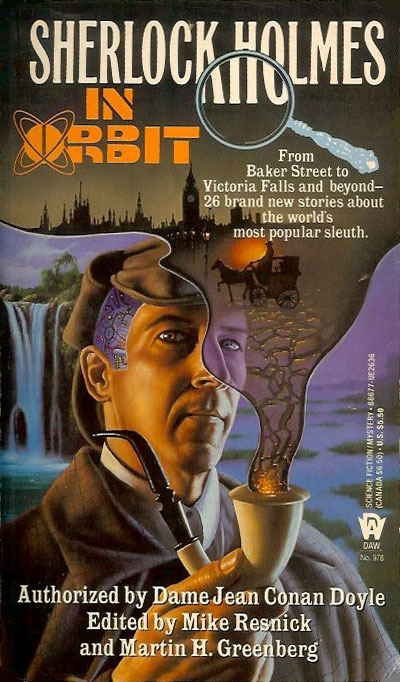 This volume, authorized for publication by Dame Jean Conan Doyle, contains stories by such top talents as Vonda McIntyre, Frank M. Robinson, Craig Shaw Gardner, David Gerrold, and Mike Resnick, masterful plotters who cleverly set their crime scenarios in every age from Holmes' era to own time or our future, and sometimes even dare to follow the great detective's career after his death. From confrontations with Fu Manchu and Moriarty, to a commission Holmes undertakes for a vampire, to a tale in which the master of logic is reconstituted as a computer program, here are truly original stories, all of which contain some science fiction or fantasy element and all of which remain true to the spirit and personality of Sir Arthur Conan Doyle's most famous and enduring creation.